Thanks to everyone who joined us for another ISHE Indiana healthcare facility project discussion and tour, this time at Major Hospital in Shelbyville. We learned and shared ideas that will make all of our Indiana Healthcare facilities safer and more efficient. The new Major Hospital opened in January 2017. The new facility is 305,000 square feet with 55 inpatient beds, 38 outpatient beds, four operating rooms and one C-section suite. The second floor of the building contains medical office buildings. Prior to design hospital staff visited several facilities that were similar in size and scope to the proposed hospital. Design objectives included energy efficiency with conventional systems, patient-centric, flexible and disaster ready. The tour will focus on the systems and operations that are making Major Hospital one of the most energy efficient hospitals in the U.S. 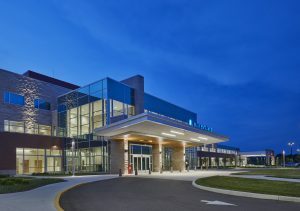 The hospital is projected to save $266,000 in energy costs (based on the ENERGY STAR Target Finder) when compared to an average midwestern hospital. Prior to the tour, representatives from the hospital and the MEP engineer will provide an overview of the design strategies. Like most other ISHE events, this event was free to ISHE members, $75 for non-member healthcare facility staff, and $225 for non-member suppliers. ISHE membership is the same as these costs ($75 for healthcare facility engineers, $225 for associate/supplier members – includes up to 3 individuals per associate member company). So if you are not yet a member, we recommend that you first join ISHE at https://isheweb.wildapricot.org/page-18082 and get all of the benefits of membership, including free registration for this event!